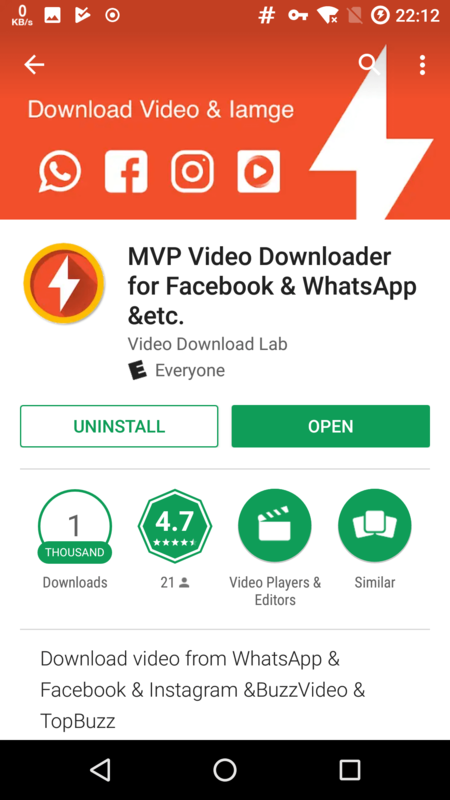 We would be using an app called MVP Video Downloader available from the Play Store for the trick.There are so many video downloaders, Why choose this one? This is an all-in-one video downloader. You only need to download this App to download videos from Facebook, Instagram, WhatsApp, BuzzVideo and TopBuzz. You don't need to download a video downloader separately for Facebook, Instagram, WhatsApp, BuzzVideo and TopBuzz. Do you like videos or pictures that your friends send in Whatsapp Status? Use MVP Video Downloader to easily find and download them. Most video downloader require you to browse the website in an internal browser. This is a bad experience. Assuming such a scenario, you find the favorite video in Facebook or Instagram. To download them, you must first bookmark them or remember their location. Then login these websites in the internal browser and find them again so that you can download the video. But if you use MVP Video Downloader, you just need to copy the download url in Facebook or Instagram when you find your favorite video, and we can start the download. It's very simple. Just two step, you can start downloading your favorite videos. Share downloaded videos to your friends. You do not need to login your facebook account in the internal browser. MVP Video downlaoder only needs you to copy link and then it will automatically download the video for you.